At The Westfield School, students are getting caught in the sticky web of Spider-Man! Mrs. Laura Harrison’s 3-D Art class, made of only THREE people, created the amazing Spider-Man installation. The total process took close to a month to complete. To introduce the tape sculpture project, Mrs. Harrison discussed the process and showed the basic method of making a tape sculpture. Due to the small group of participants, Mrs. Harrison suggested creating a scene for the installation. After brainstorming, the group chose to create Spider-Man in a web catching scene. Spider-Man is very popular at our school. The Westfield School students ages range from 4 years old to 12th grade. Nathan, Jolie, and Landon felt that Spider-Man would be quite challenging, but relatable to the younger kids. Before jumping in and beginning the actual project, the students watched parts of the Spider-Man movie. They decided on the scene that their sculpture would duplicate. 1-The students wrapped each limb separately. 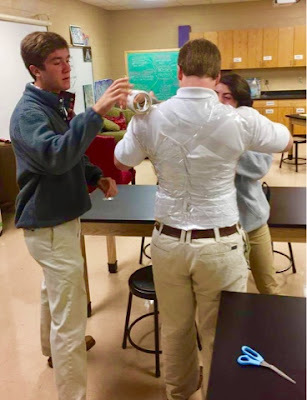 The process of wrapping is to put one layer of tape sticky OUT against their body. Then, you twist the tape and roll sticky side IN for 2 layers. 2-Carefully cut the packing tape off the body. 3-Retape cut areas and make whole again. 4-Then, they re-assemble into poses. Anatomy and balance were essential to getting the sculpture figures into position. 5-The installation process required much thought. The students had to consider the position to place the scene. They contemplated where the viewer would react to Spider-Man in the given space. Also, the different angles of the scene had to be examined. Traffic in the lobby was another factor that had to be studied. 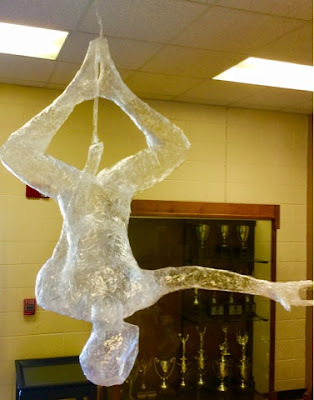 6-Once Spider-Man, the girl, and the man were in place, they used Saran Wrap to represent the webbing of Spider-man. 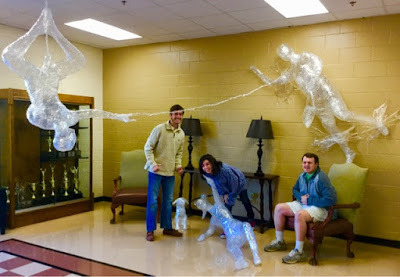 When discussing the placement of the installation, Mrs. Harrison told the students that placement in the lobby may result in damaged sculptures. The students all agreed that the art should be placed in the lobby. They were not concerned with the art being ruined by mischief or mishap. They trusted that their friends would respect their art. Honestly, respect is key in the process in the development of this art installation. Mrs. Harrison respected the students in the choice of Spider-Man. The art students respected each other when developing the plan for the installation. When choosing placement of the Spider-Man installation, the art students respected their peers by placing the art in a high traffic area. The non-art students respected the art students by admiring their work and being considerate of it invading their space. Respect…Hard to Obtain, Easy to Lose. Here’s Aretha Franklin, the Queen of Soul, singing “Respect” in the movie, The Blues Brothers. 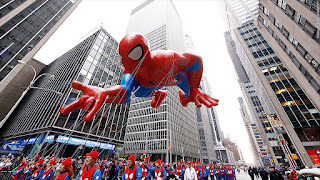 If you miss the Spider-Man’s appearance in Macy’s Day Thanksgiving Parade, you can always check him out at The Westfield School Lobby. Here's a Sundae on a Monday!